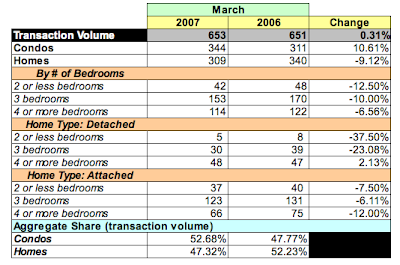 MRIS released data earlier this week reporting March 2007 sales of existing homes and condos in the District listed or sold by real estate agents. Dollar volume and average/median prices rose while transaction volume was flat and average days on market increased to 84 days. In looking at MRIS' number, I tried to figure what drove the increase in dollar volume and average/median prices given the flat growth in transaction volume. Measured in number of units sold, condo sales increased 10.61% while single family homes decreased 9.12% YoY. 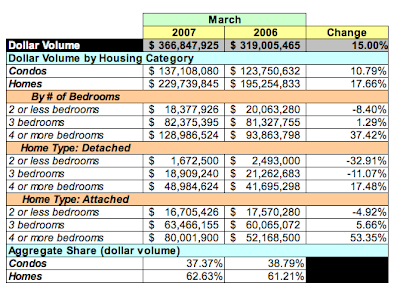 If one measures sales by dollar volume, both grew YoY: condos by 10.79%; homes, 17.66%. So, fewer single family homes sold, but for more money. 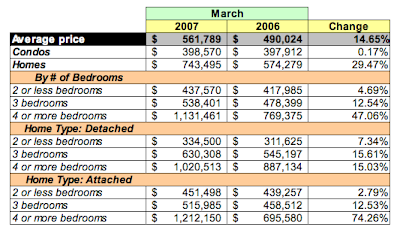 I think the driver in raising March's dollar volume and, consequently, the month's higher average price is the segment MRIS labels "4 bedrooms detach/attach" (I prefer using "high end homes"). Their dollar volume increased 37.42% compared to -8.4% for homes with two or fewer bedrooms and 1.29% for homes with three bedrooms. While the high end homes represented only 17.45% of units sold, they represented 35.16% of the total dollar volume, or $129MM. Of the 114 high end homes sold, 28 - or about a quarter - sold for more than $1MM and a quarter of those sold for more than $2.5MM. The average price of high end homes increased 47%; +15% for detached homes, +72.26% (!) for attached homes.